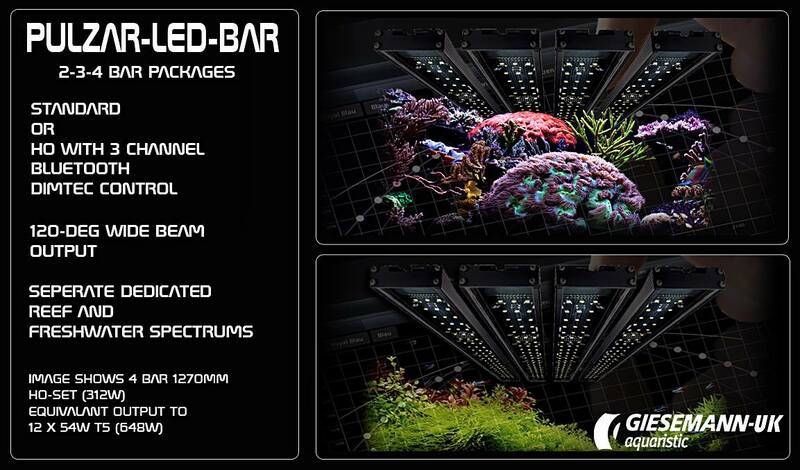 Available in both Reef and Freshwater format, each with its own dedicated spectrum, and in two versions offering standard no fuss on/off control or High output with full 3 channel Bluetooth connectivity and advanced programming capability, Pulzar offers virtually unlimited scope for lighting your reef or freshwater/planted aquarium whilst consuming almost half the energy of an equivalent T5 array, and with no ongoing replacement lamp costs. Pulzar is also highly adaptive when it comes to mounting options which include tank mount / suspension / under hood / or retrofit T5/T8 adaptors that allow the units to be fitted in place of existing florescent tubes whilst its passive cooling technology ensures silent reliable operation. At around £1700.00 for a full 4 bar array in the largest 1470mm HO version capable of lighting a 6x2x2, complete with Bluetooth control and all applicable mounts, This puts the Pulzar between £500.00-£1000.00 under equivalent high quality modular systems using 3-4 modules to attain similar results. Check out www.giesemann-uk.com for further information. Giesemann products are distributed in the US by CoralVue. by hi bounce rate. This is very important ranking factor.